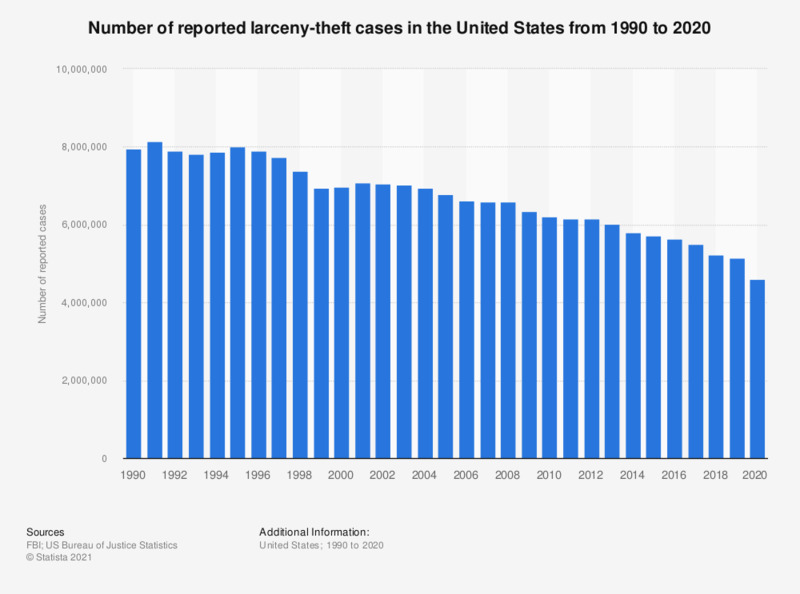 This graph shows the reported number of larceny cases in the United States from 1990 to 2017. In 2017, about 5.52 million cases occurred nationwide. Larceny is defined in the FBI’s Uniform Crime Reporting (UCR) Program, as the unlawful taking, carrying, leading, or riding away of property from the possession or constructive possession of another. Examples are thefts of bicycles or automobile accessories, shoplifting, pocket-picking, or the stealing of any property or article which is not taken by force and violence or by fraud. Attempted larcenies are included. Embezzlement, confidence games, forgery, worthless checks, etc., are excluded.